Welcome back to the SwagCast, been swamped with side work and day job past few months, but the AD Beast that be me has survived the battle, and am back to CRANKING the MOLTEN MIX Vats! Swag Cast is RETURNS for Season 7 episode #1! Been swamped with the day job and side jobs, so apologies for the LOOOOOOOOOOOOOOOOOOOOOOOOOOOOONG DELAY in new Swag Cast eps! For tonight’s foray into OTR Groovy, I will just say that Oceans, the Caribbean. E.G. Marshall, the Macabre V of P also joins the fun and the Gourmet delight of FISHY things, as well as the SEE BEE SEE Vanishes into Freaky Points of OTR AWESOME! SwagCast is Back and a dark dystopic “Blade Runner-ish” Sci-Fi recreation of the Classic X -1 Episode of “The 7th Victim” by Robert Sheckley greets you this evening! In a future which regulates the instinct for violence by staging government-subsidized hunts—in effect making a social institution of murder—there is no place for human compassion. Or is there? OTR Swag – June is CBSRMT MONTH!!! And taking a nod to E.G. Marshall – it’s dark and SWAGGY! 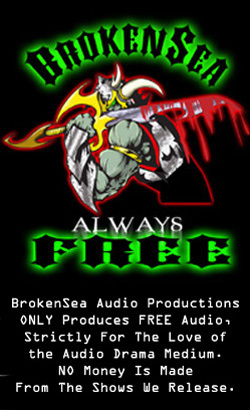 Anyway Lothar, fresh off finishing the mix of POTA UK Stage Show for BrokenSea, brings us some wild west Groovy! Gunsmoke Ya”ll! WHHEEE HAWW!!!!!!!! Enjoy, and stay listening as the trailer for the BrokenSea audio drama of the POTA UK Stage Show adaptation of Mike McCarthy’s classic simian work crashes into your audio planet! Can the apes be far behind? SwagCast Halloween is Back with Lucy Carter LOST in a haunted mansion- with only her trick shootin’ six gun and a sword she found on a suit of armor to protect her!! And the ominous DOORS of T5, CBSRMT, Light’s OUT and Gothic Soap awaiting her in OTR DOOM and HALLOWEEN GLOOM! Lyn Cullen (Lucy Carter of Jake Sampson Monster Hunter Fame) and OTR ROCK!!!!!!!!!!!!! SwagCast Halloween is Back with Jake Sampson as HOST!!! Gigantic Spiders in the jungle and more Gothic Soap! Paul Mannering’s creepy AD, “Hornblower” ! MARK KALITA and OTR ROCK!!!!!!!!!!!!! Swag’s back and the creepy is freaky! SHOO WEE! Texas Holdum here flying the Rowdy Rita through the darned worst October Storm in His-tor-EE!! All just to bring ya’ll the week 1 Halloween Swag Cast, where we all go on down to a Haunted Disco, then head over to see what all’s up with a plague in Illinois, then over to that ol’ Dunwich place before checking in on that fanged beedie offa Widow’s Hill in New England! And man is it creepy Swag Ya’ll! !